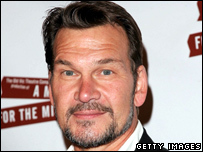 American actor Patrick Swayze has been diagnosed with pancreatic cancer, his agent has confirmed. However, his doctor said reports that the Dirty Dancing star had only five weeks to live were "absolutely untrue". The 55-year-old is currently undergoing treatment and is continuing with his filming schedule. Swayze, who also starred in the hit film Ghost, was diagnosed with cancer more than a month ago, the New York Post reported on its website. His doctor George Fisher said in a statement: "Patrick has a very limited amount of disease and he appears to be responding well to treatment thus far. "All of the reports stating the timeframe of his prognosis and his physical side effects are absolutely untrue." Swayze's agent Annett Wolf added: "Patrick is continuing his normal schedule during this time, which includes working on upcoming projects. "The outpouring of support and concern he has already received from the public is deeply appreciated by Patrick and his family." It is understood he has been working on two films due for release this year. 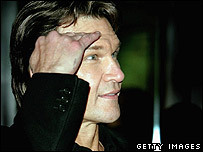 In 2006, Texas-born Swayze made his London West End debut in the musical Guys and Dolls. Swayze, who is also a trained dancer, started his career on stage and his big break was playing Danny Zuko in a Broadway production of Grease. He is best known for his roles in the films Ghost and Dirty Dancing but returned to musical theatre in 2003 when he joined the Broadway cast of Chicago. Dirty Dancing was a surprise hit in 1987 and still has enduring appeal two decades later. The movie cost £2.5m to make but took over £90m worldwide, and it went on to become the first film ever to sell a million copies on video. It won critical acclaim, Golden Globes and the soundtrack topped the charts.